It's easy for great musicians to slip out of their art's official history. In jazz, where so many artists have lived volatile and difficult lives, perhaps as many fine players and innovators are forgotten as are celebrated in the music's canon. From time to time, the memory of one such figure is rescued in extremis. Of late the Makanda Project, led by Boston pianist and arranger John Kordalewski, has been celebrating Makanda Ken McIntyre, a composer and multi-reed player who died six years ago in relative obscurity. But just as important an aim of the project is to bring McIntyre's work -- and by extension, the spirit and practice of high-quality jazz -- back to Boston's historic African-American community. McIntyre, who was born in 1931, grew up on Wellington Street in the South End when that neighborhood and Lower Roxbury made up the heart of black Boston. He played around Boston during the heyday of the local jazz scene in the 1950s, before moving to New York and eventually spending the bulk of his career as an educator and pioneer of jazz stud ies, notably at SUNY at Old Westbury on Long Island. 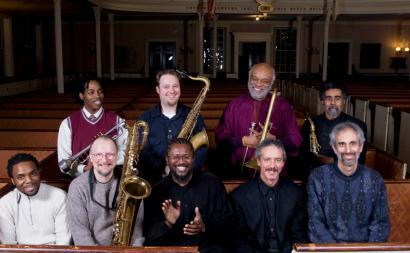 Tomorrow afternoon the Makanda Project plays on the grounds of the First Church in Roxbury on John Eliot Square. It's the first of three performances in venues associated with black Massachusetts. On Aug. 4 the group plays in Oak Bluffs to benefit the Martha's Vineyard NAACP, and on Aug. 7 they perform in the Elma Lewis Playhouse series in Franklin Park. Kordalewski says that rooting the band in Roxbury is central to the group project. "We're trying to establish a presence for the band in the community," he says on the phone from his home. "You can't leave behind the folks who nurtured you. Makanda grew up in the heart of Boston's African-American community." Moreover, Kordalewski says, Roxbury has played a strong part in his own artistic growth and in that of several bandmates. The group includes Salim Washington, a distinguished tenor sax and flute player who lived many years in Boston and now teaches at Brooklyn College, and whose Roxbury Blues Aesthetic was one of the most powerful and original acts on the local scene in the 1990s. Both Kordalewski and Makanda Project alto saxman Kurtis Rivers took part in RBA, which put out only one album, 1997's "Love in Exile," but held down a long residency at the now-defunct Roxbury jazz club Connolly's. Other group members are similarly stalwarts of the local scene, such as baritone saxmen Bill Lowe and Charlie Kohlhase. The horn-heavy group -- there are nine horns total, plus Kordalewski, bassist John Lockwood, and drummer Yoron Israel -- also features a major national figure, the veteran saxophone master Oliver Lake. In spirit, personnel, and instrumentation, the group strongly echoes Washington's RBA. "In a sense this is the successor," Kordalewski says. "But the music is quite different. Makanda's writing has a different flavor." A recent listen to a few rough tracks that the group is currently mixing confirms this. RBA's songs, many penned by Washington, emphasized texture, the ebb and flow of horns crafting achingly lyrical soundscapes. Makanda's writing and Kordalewski's arrangements are more narrative. The progressions from sauntering flute line to ensemble horn swells to almost retro swing passages evoke, by way of quick comparison, the gracious eclecticism of a Duke Ellington suite. Kordalewski doesn't hesitate to rank Makanda as one of the great jazz composers, in the class, he says, of Wayne Shorter, Thelonious Monk, and Charles Mingus. "He was that brilliant," he says. "His music isn't just 'out.' It swings, it's lyrical, it does many different and unexpected things. "He didn't like being called avant-garde, but he wasn't playing be-bop either -- even though he was tremendously influenced by Charlie Parker," Kordalewski adds. "There was just a tremendous breadth to what he did." It will take the group's album, which Kordalewski expects out later this year, to put all these comparisons to the test. But without the group's efforts, McIntyre might have been forgotten altogether, and a huge body of work never come to light. His recording legacy is scattered across dozens of appearances as a sideman. Faced with a shortage of paying gigs and the chronic fragility of making a career in jazz, McIntyre found stability and fulfillment in teaching. On his death, his widow found about 400 compositions that had never been recorded -- multiplying his known output by almost a factor of four. Kordalewski and friends haven't yet worked their way through the whole pile -- "Hell no! Only about 150 of them," he says -- but they have dedicated themselves to bringing as much as possible of this work to life and preserving it for posterity. The upcoming gigs extend that mission to include a homecoming of sorts for Makanda's music, back into the community where he had his roots. By the same token, they are an effort on the part of these musicians to help revive jazz presentation in Roxbury. The scene there has receded. "It doesn't exist anymore," Kordalewski says flatly. "But what we've found is that there is an audience for jazz in Roxbury, as warm and in tune with what we are doing as any we've found anywhere. But nothing is being offered." The community group Roxbury Action Program is sponsoring the John Eliot Square concert. Lloyd King, who runs the organization and has brought similar shows to the square in the past, sees these concerts as a chance to revive an interest in jazz and its role in the community, among young people in particular. "I knew Makanda as a young man many moons ago," says King. "To have his body of work played in the community is a major contribution to making the connection between our elders and children. We have a broad mission to enhance our cultural giants and reconnect them with the community. The younger generation is immersed in hip-hop but they don't know the fundamentals that got us here." The Makanda Project is looking to fill a gap not just for this audience but for jazz lovers in general, Kordalewski says. "We're playing music that needs to be played, and honoring a brilliant person who didn't get his due."